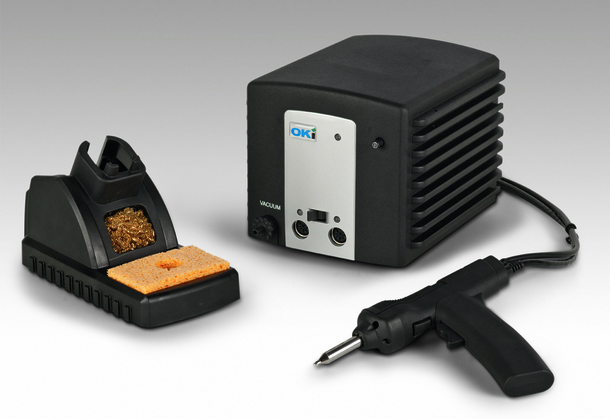 OK International (OKi) announced recently the discontinuation of their original Multi-Function Desoldering Systems. The discontinued items have been replaced with OKi’s MFR-1150 and MFR-1300 Series Desoldering and Rework Systems. The discontinued part numbers include the following: the MFR-DSI Desoldering System, the MFR-DSX Desoldering System, the MFR-SDI Soldering/Desoldering System, the MFR-SDX Soldering/Desoldering System, the MFR-PS2K Two-Port Power Supply, the MFR-PS2X Two-Port Power Supply, the MFR-HDS Desoldering Handpiece, and the MFR-WSDS Workstand. The MFR-1300 or MFR-1500 Series can replace most of these parts. For instance, the MFR-DSI and MFR-SDI have been replaced by the MFR-1300 Desoldering Systems. The 1300 Series use the same desoldering tips as the discontinued systems. The MFR-H5-DS is backwards compatible with the old MFR-HDS Handpiece. And the MFRDSX has been replaced by the MFR-1150 Desoldering System, which includes the MFR-H5-DS Handpiece and MFR-WSDSX Workstand. The replacement parts are as indicated: MFR-1350 Dual Output Desoldering System w/Internal Pump, MFR-1150 Single Output Desoldering System, MFR-1351 Dual Output Soldering/Desoldering System w/Internal Pump, MFR-PS1300 Switched Power Supply w/Internal Pump, MFR-H5-DS Desoldering Handpiece w/Selectable Grip & Cord, and MFR-WSDSU Universal Workstand for Desoldering Handpiece. For more information, or to place an order for, OKi Desoldering Systems please visit QSource.com. You can also give us a call at 800-966-6020 or contact us via email. If there's a product or topic you'd like to see The Q Source Resource write about please let us know. We'd also appreciate if you share this blog post with your friends and colleagues via the social media links below. If you have questions or comments about OKi products or related topics please leave us a message in the comments section.